In the Circus Building we have the perfect setting if you are looking for a Copenhagen conference room where you can conduct a conference for your company, customers, employees or business partners. When you rent the Circus Building inspiring conference rooms in Copenhagen, you and your guests are guaranteed a day where all details are considered. We have many years of experience in hosting conferences, so the day can be organized according to your wishes and needs. In addition our state-of-the-art technology makes us capable of hosting some of the biggest conferences in the city. If you need to address your employees through a speech, hand out awards, or something else, we are keen on taking your requests into consideration when scheduling. At the Circus Building, we have made the process of booking a conference in Copenhagen as convenient as possible, while still offering an extraordinary experience both from an entertainment and gastronomical perspective. When booking a conference in Copenhagen, we have two fully-furnished, ready-to-use rooms which can accommodate every need of your company. Our Circus Hall is our most spacious room with seating for up to 1000 guests. 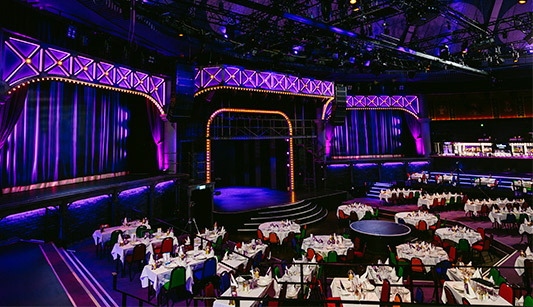 The atmosphere and setting of our Circus Hall have a track record of several successful conferences and seminars in Copenhagen. Furthermore, we offer a team of technicians offering technical assistance if you plan on doing presentations, showcase or anything else related to the usage of video or audio presentations. We have showcased an example below of how the scheduling could look for this type of conference venue. This example should just be seen as inspiration. If you are looking for conference rooms in Copenhagen for under 150 guests our Buddha Lounge is the ideal choice. Buddha Lounge offers round tables for sitting accommodating up to 10 people per table complimented by a middle-eastern, Arabian nights atmosphere. This conference room is eligible for 25-100 attendees. See the menu for august 2018 – june 2019 in the Circus Hall. See the menu for august 2018 – june 2019 in Buddha Lounge. The final programme will be prepared entirely in accordance with your wishes. It takes a lot to create a successful event as a Copenhagen conference venue organizer. If you choose our conference rooms in the heart of Copenhagen, then you can be sure to get professional advice throughout the process, as we have many years of experience in hosting conferences in central Copenhagen. The Circus Building has a beautiful central location close to the Central Station and Tivoli Gardens, so all your conference participants can easily get to and from your Copenhagen conference venue. Whether your participants are coming by public transportation, car, bike or by foot, the Circus Building offers facilities, which are easily accessible. Read more about parking close to the Circus Building here. By choosing our Copenhagen conference rooms with a location accessible for everyone, it is more likely that most of the invited will participate. After the conference has ended attendees will have central Copenhagen and its possibilities within reach, whether you are looking for going somewhere else or transportation home. If you are interested in booking your next Copenhagen conference venue at The Circus Building, you are always welcome to contact us and together we can find the best solution for you and your Copenhagen conference venue. Whether you are in the idea phase or far in the planning process, we help you with whatever you need. Send an e-mail to event@cirkusbygningen.dk with a few words about your needs and we will contact you with a tailored Copenhagen conference venue for your company. If you are looking for a conference room with large capacity in Copenhagen, the Circus Hall is the right solution for you. The Circus Hall has a capacity of 200 – 1000 people. Here you have plenty of opportunity to invite everyone on your guest list, whether it is a company-specific or private Copenhagen conference. 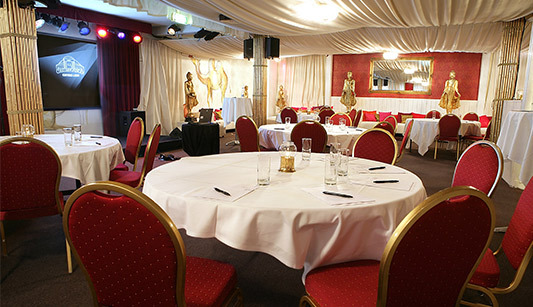 The Circus Hall offers magnificent surroundings that will impress your conference guests. The appearance and size of our Copenhagen conference room means a lot for the participants as it helps create a unique atmosphere. The Circus Hall is also equipped with state-of-the-art technology, so you can be sure to have the most advanced technology available. If you have several presentations within the conference, you are sure to get the most cutting-edge visuals and audio at The Circus Hall, which create the best possible experience for your attendees. Our technicians will work together with you to create the best flow throughout your presentations and to make sure everything works satisfactory at your Copenhagen conference venue. However, if you do not need lots of space, you can instead book our other conference room in Copenhagen: Buddha Lounge, which is the old stables of the Circus Building. Here you have the opportunity to invite between 25-100 people, which is perfect for small-medium sized companies, management or specific departments within a company. Buddha Lounge gives you a more exotic and intimate atmosphere, which is perfect for smaller conferences. It is a wonderful and inspiring contrast to traditional conferences rooms, which has the facilities you need. Here you also have the possibility to tailor your Copenhagen conference venue towards your wants and needs. It is our utmost priority to make sure that you get something special in return for using our conference rooms. For several years, we have held conferences in Copenhagen for a string of Danish and International companies. Below you can read more about why one of our former customers believes that the Circus Building creates the best surroundings for a conference in Copenhagen. At the Circus Building we are ready to accommodate you throughout the day, whether you are looking for a conference venue located in Copenhagen or just a perfect ending to a long day. Whether you have been attending a conference at the Circus Building, celebrating a great company event or the annual Christmas party, then you are welcome to join us at Wallmans and have a delicious dinner with international entertainment. You do not have to have your conference with us in order to offer your guests the perfect ending to the day. Being centered in the middle of Copenhagen makes us easy to reach and depart from, whether you are attending a conference in one of our rooms, or joining us for an incredible night at Wallmans. When having a conference in the Circus Building, it is possible to choose selected acts from the Wallmans show to entertain you throughout the day, maybe between your own presentations. The artists from Wallmans are ready to deliver a magnificent show, while our chefs create a delicious menu. Read more about Copenhagen conference dinner here. If you are interested in hearing more about your possibilities for booking a Copenhagen conference venue, please feel free to contact us at +45 3316 3700, event@cirkusbygningen.dk or send an inquiry.